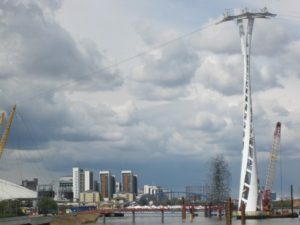 The Emirate Airline London Thames Cable Car is a cable car providing a crossing for pedestrians and cyclists across the River Thames between the O2/North Greenwich Arena on the Greenwich Peninsula and the ExCel centre at the Royal Victoria Docks in Newham. The 34 cable cars will be capable of carrying 2,500 passengers an hour across the 1.1 kilometres stretch of cable. The gondolas will run every 30 seconds and travel about 160 feet above the river. The trip will take 5 minutes. Can get wobbly when windy! The Greenwich cable car station is set back some 110 metres from the river. It is 300 metres south east of North Greenwich Underground Station and bus terminus and 240 metres south west of Queen Elizabeth II Pier which is served by the Thames River Boat from Central London piers. 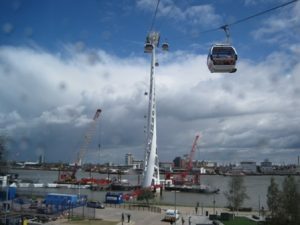 In Newham the cable car station is located in the north west part of the Royal Victoria Docks 500 metres to the west of the ExCel centre and 140 metres south of Royal Victoria Docks Docklands Light Railway Station. 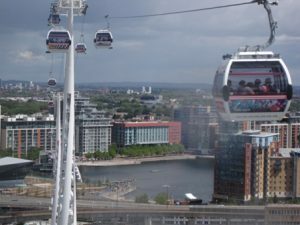 The cable car has a length of 1,100 metres over the River Thames and the gondolas travel at a height of more than 50 metres above the water (the height of a 17 storey building). The towers supporting the cable car are white steel structures with a base diameter of 10 metres tapering to 6 metres and a height of 84 metres. The towers are circular at the base changing to an ellipse at the upper level. The steel sculpted structures comprise an external ribbon-like spiral with a steel staircase within spiralling in the opposite direction to the external ribbon. The design is such as to maintain views through the structures thus minimising their visual impact. The cable car is powered from the Newham side with the Greenwich side acting as the ‘return’ station where the cable returns back on itself. The Mayor of London – Boris Johnson – oiriginally stated that the project would be privately funded. But as the 2012 Olympics approached the private firms held out for a good deal. The Mayor blinked and Transport for London ended up underwriting the scheme. The company Emirate Airlines is sponsoring the cable car for £10 years to the amount of £36 million.